This dish combines some simple but favorite ingredients together. I will substitute broccoli or peas if on hand to make a satisfying easy dinner. Wash and dry asparagus. Place stalks in a baking pan large enough to hold them in one layer, and gently rub them with 1/2 tablespoon olive oil. Sprinkle 1/4 teaspoon salt over the asparagus and bake in a preheated 425 degree oven for 12 to 15 minutes, depending upon the thickness of the stalks. when cool enough to handle, cut into 1/2-inch pieces. In a generous amount of salted boiling water, cook the fettuccine until al dente. Drain, place in a bowl and toss with 1/2 tablespoon olive oil. Pour wine into a large skillet or pan. Add shallots. Reduce over medium heat to one half. Wash lemons well with soap and water, rinse and dry. Add grated rind and juice from 2 lemons to the wine. Simmer 2 minutes. Add cream. Bring to a boil, then lower heat and add 1/3 cup cheese, 1/4 teaspoon salt and cayenne pepper. Simmer slowly, whisking constantly, about 4 minutes, or until sauce begins to thicken. Cut cold butter into small pieces and add to the sauce, cooking 1 minute. 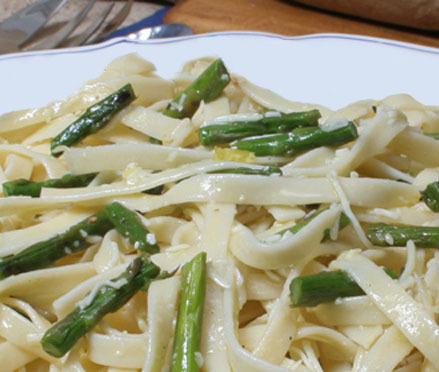 Add asparagus, pasta and 2 tablespoons cheese. Toss until pasta is thoroughly coated with sauce and heated through. Divide pasta evenly in heated plates or soup bowls. Sprinkle with grated peel from remaining lemon, chives and mint.